highlights the 300th anniversary of the signing of the Charter of the City of Annapolis to gain independence for its governing body. Artwork and sites were chosen specifically to honor the communities and residents within the city who have contributed to its rich history. Greg Harlin ’s magnificent historical painting honors Annapolis’ maritime and military heritage and its significant role in our modern day liberties. The artwork features on of American history’s legendary frigates, The Ranger commanded by John Paul Jones. Harlin’s John Paul Jones’s Ranger is an energetic work befitting the pedestrian entry of the United States Naval Academy, dramatizing the bravery of Americans in protecting our country’s ideals. This image of Anne Catharine Green pays homage to her as the first woman printer/publisher in the country. Green courageously expanded her husband’s business, the Jonas Green Print Shop, after his death, serving as editor and publisher of the Maryland Gazette, which is still in circulation today. Anne Catharine Green was a courageous and visionary Annapolis woman who contributed to our country’s fight for freedom by acting as a force for change, dissension and economic independence. Sy Mohr’s Annapolis Harbormaster Collage speaks to the magical landscape that welcomes citizens and visitors alike to the City Dock and the historical City of Annapolis. His work takes us on a trip through time, progressively moving from the past in the foreground to present day representations in the background encompassing the eclectic mix of people and their streetscapes. 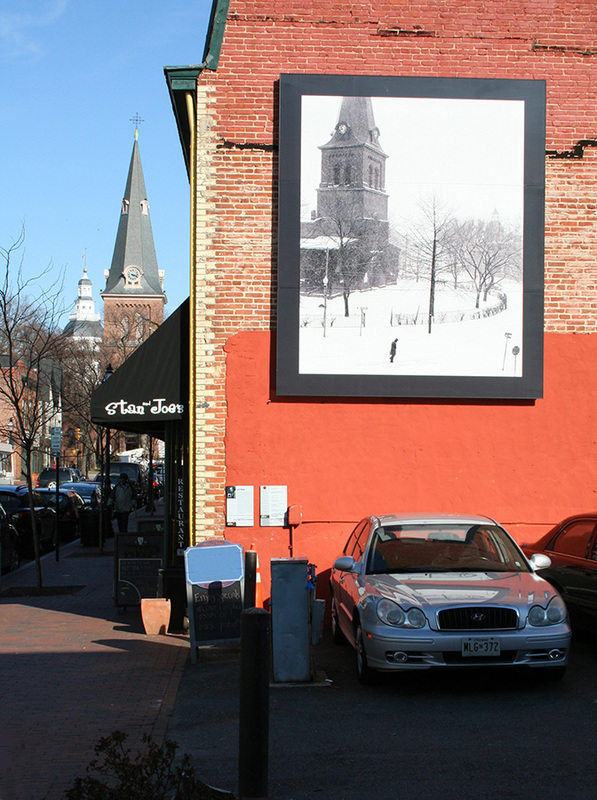 Marion Warren’s six photographs capture this historic Annapolis neighborhood in a sleepier time: a lone midshipman slowly trudging through the snow by St. Anne’s Church; the official vehicle in front of Farmer’s National Bank; men chatting by the Courthouse fence; garden club members selling flowers; a family waiting for a parade; and neighborhood markets. People are recorded living, working, going about their everyday activities, and enjoying life’s simple pleasures–as generations of Annapolitans have done on these streets for years. 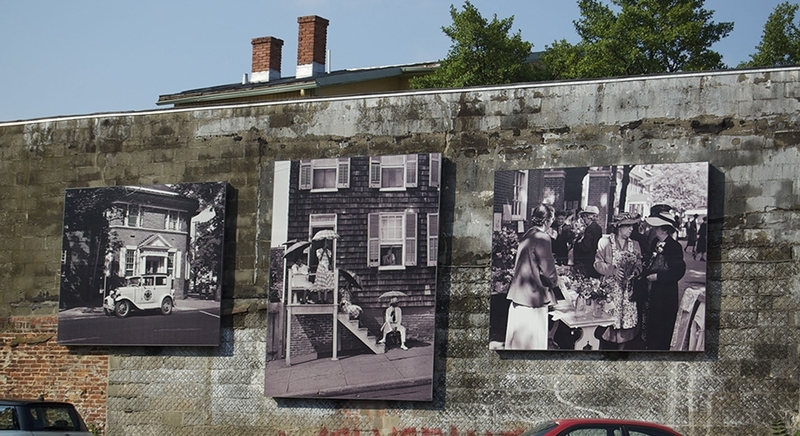 Sally Wern Comport’s two dimensional artwork Shaping a City on the Newman Park fence celebrates the humble working class that built the foundation of Annapolis. Rich in agricultural and maritime history, these industrial trades fostered Annapolis's vital role in our country’s development. Take a short walk across the street to the seasonal farmers market or over the bridge to Eastport, a neighborhood rich in maritime history. This artwork, part of the Annapolis 300 celebration, is at the entrance to the Clay Street community. Clay Street was “uptown” to a sizable African American population and provided a storied cultural resource to the entire city. 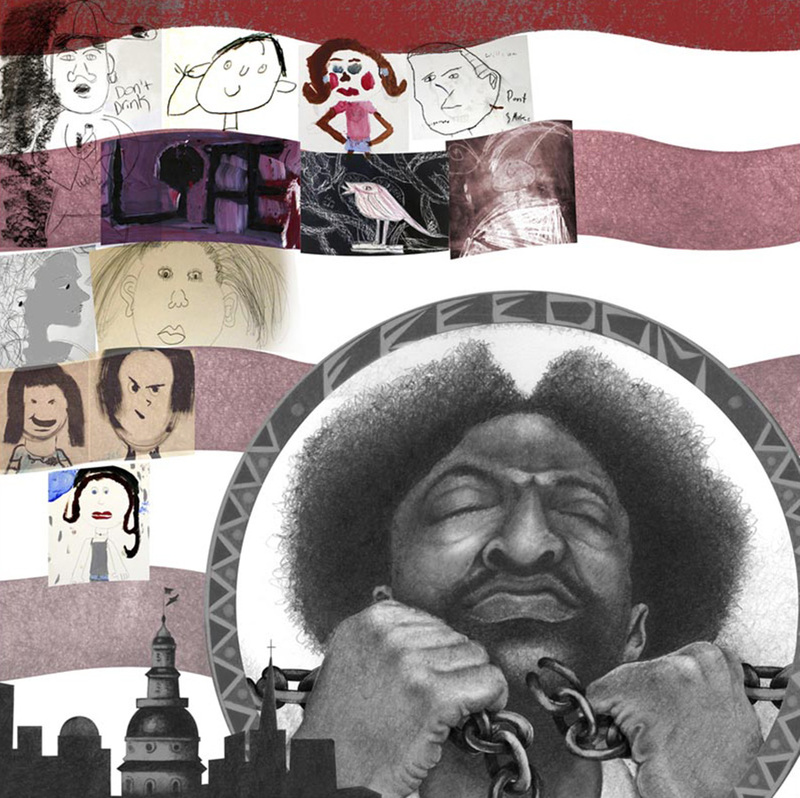 The drawings by young artists (ages 5-13) offer diverse images and hopeful viewpoints.